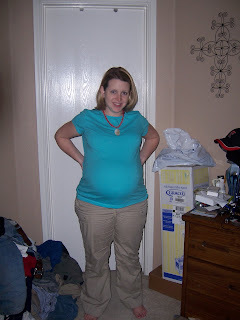 Well here we are at 36 1/2 weeks, or just a little over 9 months, and less than a month to go. Taylor and I got a good but interesting report at the doctor yesterday. We first went in for an ultrasound to see how big our little girl is getting. 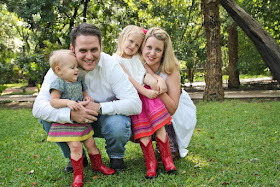 By the way, she is a little girl and we reconfirmed that! First off, she is being stubborn and is currently breech. For those of you unfamiliar to pregnancy terms like I was before this, that means that she is head up right now and in the wrong position for birth. Next, the doctor informed us that she is approximately 7.25 lbs! She truly is the little hippo that Kellie keeps calling her. See attached pictures and you'll realize that she has grown. I didn't even realize how big I've gotten until looking at the side profile of myself tonight. Holy cow! Back to the doctor visit. 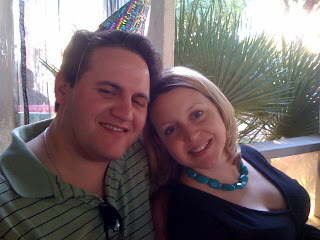 After the ultrasound we went down to see my OB. My blood pressure is still low, weight gain normal, and my swelling feet didn't seem to bother her. 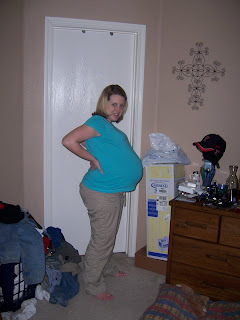 Due to Taylor's breech status we had to make a decision last night about whether or not we wanted to try inversion, or a process where they push on the belly and try to get the baby to turn. 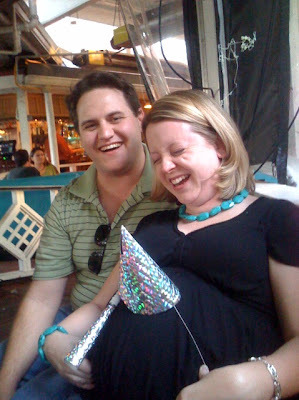 We've decided to not go with it and so the doctor had us schedule a C-section for 39 weeks. Taylor is now scheduled to be born at 11:30am on April 15th. She's going to love being a Tax Day baby! I am hoping that she doesn't wait that long to come since she's getting really heavy and now I know why! We are ready for this little girl to come. 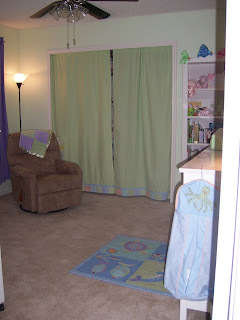 Her room is ready and now we just wait until she's ready. The past 24 hours have been a little overwhelming as we let it sink in how big Taylor is and that I'm pretty guaranteed to have a C-section unless she randomly turns between now and then. I guess our little girl is preparing us for what will be a very overwhelming next 18 years...25 years....not sure it ever ends. Our parenthood adventures begin now! For now I will leave you with the entertaining(they really are since I am just HUGE) pictures to go put up my swollen feet. I will save you the pictures of those just yet. We go back to the doctor every Wednesday until Taylor comes, so I'll email more about Taylor next week. 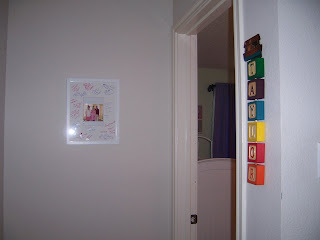 This is the view as you reach the top of the stairs and round the corner towards Taylor's room. The frame straight ahead is from my Fort Worth shower. The mat is signed by all my family and friends and is just waiting for Taylor's picture. As you enter the door this is the view. 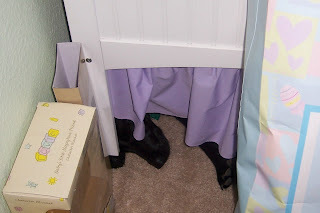 You can see the new curtains on the closet(Thank you Terrie aka Mia!). Also you can see my new rocker recliner that will get tons of use and is super comfy! That will make all those feeding s at 4am much easier and I'll try not to fall asleep myself! 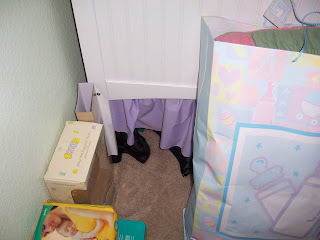 As you look to the left of the closet you see a better view of my chair, sorry Chris, our chair and the purple curtains on the window. Another thanks goes out to Mia on those too. Thank god she helped do the sewing for the baby's room because I'm not sure how a pregnant Wendy behind the sewing machine would have been. 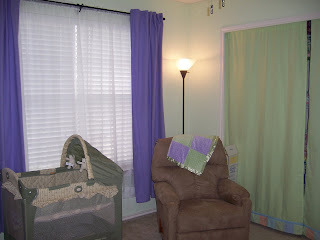 The bassinet in front of the window will actually be going in our bedroom for Taylor to sleep in for a few weeks. This is the shelf that we will be storing Taylor's breakables on until she figures out how to climb the crib and reach across to it. I'm sure all those stuffed animals will be tempting for her to play with, including her dad's Champ Bear Carebear. Yes that's right, Chris has a Carebear. 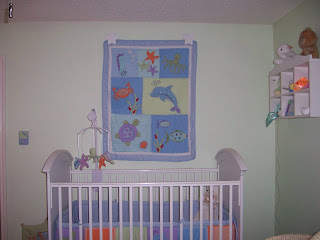 You've seen the crib in previous posts, but we hung the quilt above the crib so that you could see all the cute sea animals. While I'll be in the chair, this is where you will find Chris after Taylor is born. :) I love how soft the changing pad cover is! By the way... in one of these drawers is where all the precious bows are stored! You've also seen the bookshelf before, but I'm sure it looks a little different now. Taylor has started her collection of books and stuffed animals to start her off. 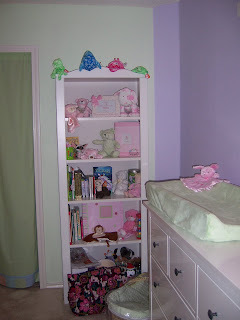 On the top left corner of the bookshelf is the frog that kept Chris company in a previous blog. So far Sadie hasn't touched a single stuffed animal in Taylor's room. I wonder how long that will last. So I know you've been wondering what was behind those green curtains and it's more than just the closet organization system that Chris put in. It's FULL of little girl clothes, blankets, diapers, bath supplies, toys, bottles, and all kinds of baby items that our friends and family have given us. I think I've bought 2 outfits for Taylor so far . Keep in mind that the closet goes back to the right and left for a few feet! We truly are blessed to have been given all these wonderful things. I hope Taylor knows how many people love her! 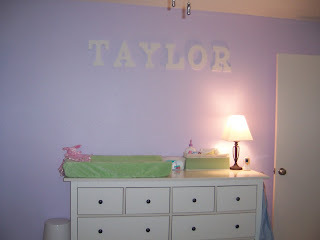 Well that concludes the tour of Taylor's room. I hope you've enjoyed it and if you stop by to visit after she is born, please don't expect it to look this clean! So if you've been wondering where I've been instead of posting the pics that I promised a week ago then take a look at all these cute goodies I found for Taylor on Friday. 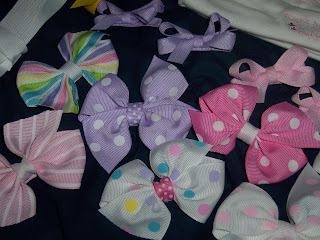 I loved wearing bows as a little girl and plan on making sure that Taylor has bows to go with all the cute outfits that we've received. My intentions were not to buy bows Friday, but to find a hat for her to wear home from the hospital and I came home with both. 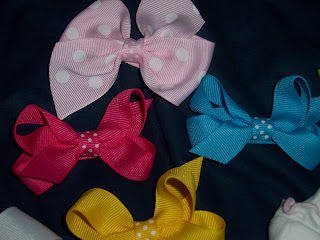 I have found a website that shows me how to make bows and I'll be attempting that later on, but these were too good of a deal to pass up on. All Chris could say was 'No Bows, No Bows, No Bows!' as I showed him all my finds. But how can you resist the cute strips and polka-dots??? Guess it's a girl thing. 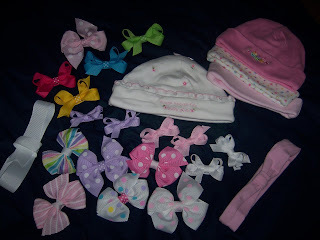 I figured Taylor may not want to look girly when she gets older, so I only get a few years to get these in there! The picture doesn't do these quite justice, but they are all your bright spring colors like lime green, hot pink, turquoise, and lemon yellow. Now I just need the baby to put them on.... 26 days and counting down. Just a quick post because I had to share the pictures. We were at the 50th birthday party for a friend tonight and Chris and I decided that Taylor should join in on the birthday fun. I could not stop laughing and Taylor even got going after I was laughing for so long. Doesn't take much to entire the Lambert family! Thought I would also share this normal picture of Chris and I too. Hope everyone is having a great weekend and enjoying this beautiful weather! 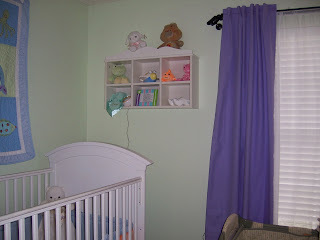 I have been working in the baby's room most of the day and am almost to a picture taking point. Check back tomorrow for room pics. If you can't find her, then look a little bit closer to the bottom of the crib. One of Sadie's favorite sleeping spots in the nursery is under the crib. I was able to move a few things and get a picture of her slacking off while I was working in there the other day. I've almost finished all the thank you notes and putting away the gifts. Taylor already has a closet full of the cutest clothes and I've only bought her two things myself! 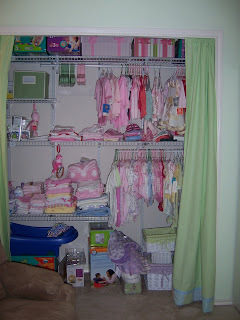 I'll post pictures in the next day or so of what her newly organized closet looks like. 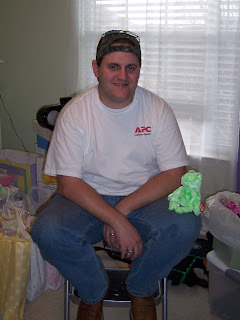 Chris was in the nursery the other day as I was showing him all the different gifts we have recieved and was humoring me a bit. It took a few passes of me going back and forth to her closet for me to realize that Chris had this little frog hanging out with him. This is one of the many reasons I love this man... he can always make me laugh!